Dr. Mikhail Varshavski D.O. is a New York-based doctor focusing on family and preventative medicine. Better known as ‘Doctor Mike’, he is a social media entrepreneur, philanthropist, and doctor with purpose. He stresses the importance of preventative medicine to members of the public by highlighting his experiences through his unique journey. As a family medicine provider, Doctor Mike has the unique ability to speak about issues that not only fall within the full spectrum of medicine but also within the full patient experience, as he is the first and last point of contact for patients who come to him with an extensive range of conditions. In addition to his social media entrepreneurship, Doctor Mike launched his own charity, ‘The Limitless Tomorrow Foundation.” Established in late 2015, LTF aims to break the financial barrier for unique and capable individuals and seeks to empower candidates to reach their full potential, explore the world and conquer their hardships. Aside from to his own foundation, he has been involved with other philanthropic endeavors including Stand Up For Cancer, AmeriCares, and the Susan G. Komen Foundation. 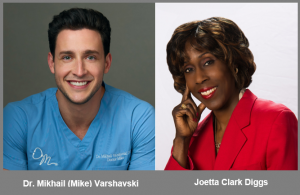 Currently, Doctor Mike is focused on giving back by speaking at events (Columbia University, iHeartRadio Lifestyle/Health Expo), television programs (The Doctors. Dr. Oz), and charity events (SU2C). Doctor Mike graduated from the New York Institute of Technology in 2014 with a B.S in Life Sciences and a Doctorate in Osteopathic Medicine via an accelerated 7-year track. On June 30, 2017, he completed his three-year Family Medicine Residency at the Atlantic Health System-Overlook Medical Center in Summit, NJ. He emigrated with his family from Russia to Brooklyn, NY at the age of 6. An Olympic athlete who has made an indelible impact on sports and business. In her legendary 24-year elite career as a half-mile runner, Clark Diggs represented the United States of America at the 1988, 1992, 1996 and 2000 Olympic Games. Clark Diggs is a University of Tennessee graduate who has also made her contribution to society as an inspiring motivational speaker, respected businesswoman, critically acclaimed author, noted television /radio personality and an advocate for health and fitness initiatives. The New Jersey-native established the Joetta Clark Diggs Sports Foundation in 2002 to promote involvement in physical activities for girls and boys in grades K-12. The Foundation is committed to teaching good health and positive work ethics associated with participation in sports. In addition, it strives to introduce the different opportunities to children in the sports and entertainment industries and focuses on the correlation between academics and athletics. The Joetta Clark Diggs Sports Foundation’s annual programs include the Financial & Fitness Expo the Head 2 Toe® Fitness program, the Fitness Challenge®, Eliminate Excuses™ and Joetta’s Geniuses. The Foundation has brought happiness and education to over 50,000 children in the area. Clark Diggs is also the President of Joetta Sports & Beyond, LLC (www.joettasportsandbeyond.com), where she delivers messages of health, fitness, and empowerment to corporations, colleges, medical programs, and civic organizations. In 2009, she authored her first book Joetta’s “P” Principles for Success: Life Lessons Learned from Track & Fields. The acclaimed book has been considered a tremendous resource for both corporate executives and to the youth. During her career running in both the 800 and 1,500-meter competitions, Clark Diggs was ranked among the Top-10 Americans for over 21 years. From 1991 until 1998, she was ranked in the Top-10 in the world and was an 11-time USA National Champion. Additionally, from 1979 until 2000, the year she officially retired, Clark Diggs competed in 20 USA Indoor and Outdoor Championships and six Olympic Trials. In addition, she has set World and American records, captured World Championship medals, and served as the Captain of the Women’s USA Team in 2000. In 2013, Clark Diggs was named for induction into the prestigious New Jersey Hall of Fame. Also among her long list of career honors has been her induction into the USA Track & Field Hall of Fame, Star-Ledger Women Athlete of the Century, member of the Circle of Red (American Heart Association), Board Member of the Raritan Valley Community College and more. Clark Diggs left her mark prior to graduating from the University of Tennessee. While in Knoxville, she was a nine-time NCAA champion and 15-time All-American. She would later be inducted into the UT Hall of Fame in 2001. Clark Diggs is married to businessman Ronald Diggs and they have one child.